Saw that Pir, Imaginative Rascal could add a counter to planeswalkers whenever they plus and went I am making that deck. The deck wants to get Pir, Imaginative Rascal out consistently by turn 3 so that you can start playing planeswalkers with many counters on them, and ulting as quickly as possible. There are 9 planeswalkers that can ult within a turn of them being played when pir is out, the rest can ult within 2 turns as long as Pir, Imaginative Rascal is still in play. Doubling Season and The Chain Veil are obvious includes as they both allow you to abuse planeswalkers and ult them usually on the same turn as playing them, leaving few opportunities for opponents to respond to the deck. Other, less grindy, wincons include the classic Rings of Brighthearth + Basalt Monolith combo to create unlimited mana and then from there you can cast Walking Ballista to kill everyone at the table. If you want to do more fun stuff and annoy opponents, you can use The Chain Veil with unlimited mana and Tezzeret the Seeker to ULT ALL THE PLANESWALKERS FOR EVER!!! 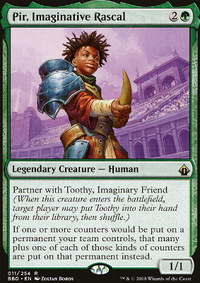 Finally Toothy, Imaginary Friend can get pretty big due to all this card draw that is going on, so make him unblockable and swing for lethal, just make sure to protect him a bit so you don't deck yourself. My experience with this deck has been nothing but good times so far and is one of my favourite decks that I've built so far. It isn't super competetive but is definitely not weak. Also fun tip, Spike Weaver and 3 mana equals never ending fog.